Physician assistants (PA) are in a position to positively impact the lives of patients and the community as a whole, Mary Ogunsanya, MD, told the faculty, students, and alumni of the PA Program at the George Washington University (GW) School of Medicine and Health Sciences (SMHS) during the 2018 PA Week Reception. 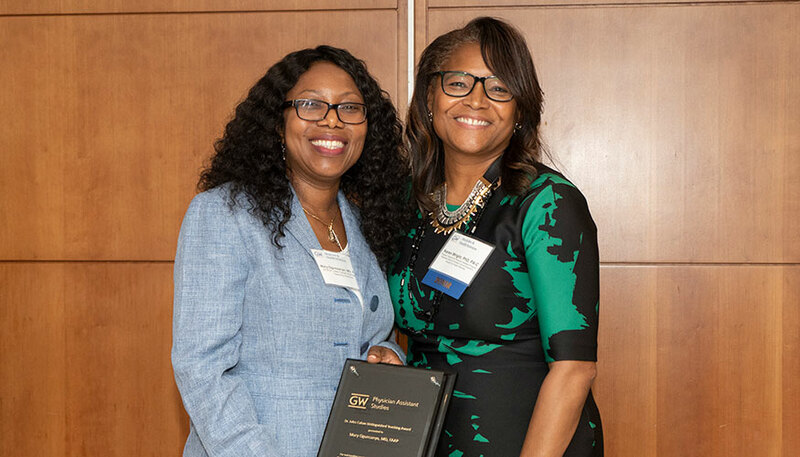 Ogunsanya, an assistant clinical professor of physician assistant studies at SMHS, received the Dr. Jules Cahan Distinguished Teaching Award at the reception for her dedication to GW’s PA students. In addition to Ogunsanya’s award, the PA Program faculty also presented the Distinguished Public Service award to James Cawley, PA-C, MPH, DHL (Hon. ), professor of physician assistant studies at SMHS and professor of population and community health at the Milken Institute School of Public Health at GW. The award recognizes a member of the GW PA community who has made important contributions to the advancement of the PA profession. “Given his more than 40 years of service as a PA, as an educator, as a scholar, as a leader, I can’t think of anybody more deserving of this recognition,” said Maura Polansky, PA-C, MS, MHPE, chair of the Department of Physician Assistant Studies. A video tribute to Cawley ahead of his retirement at the end of December also was shared at the event. The Terrence E. Barr Memorial Scholarship, named for a longstanding preceptor of the PA program and awarded to a current PA student for demonstrating evidence of leadership, service, and advocacy, was presented to Lisa Chuong, a member of the PA Class of 2019 who is also pursuing her MPH degree. She was selected based on her willing attitude and readiness to serve, said Wright. Not only did students in the GW PA Program spend the week celebrating the profession, they also took the opportunity to exemplify Ogunsanya’s words and make a positive impact in the community. Over the course of the week, PA students participated in various volunteer activities, which included setting up donation boxes to collect food and other supplies for The GW Store and the Capital Area Food Bank, as well as volunteering at the GW Grow Garden and holding a bake sale to benefit the PA Program Tolton Student Society and nonprofit Miriam’s Kitchen.